John F. Fallon was awarded the 2013 Developmental Biology-Society for Developmental Biology Lifetime Achievement Award for his sustained contributions to the field. Fallon, an emeritus professor at the University of Wisconsin-Madison, has spent most of his scientific career pushing forward the field of limb development, dissecting the workings of the apical ectodermal ridge (AER) and the zone of polarizing activity (ZPA). Fallon's earliest work in the late 1960s with John Saunders, showed cell death in the developing limb bud to be a normal developmental process. In the 1990s he was one of the first groups to identify Fibroblast Growth Factor (FGF) as the outgrowth signal from the AER. He has explored many evolutionary quandaries including how amphibians form free digits without interdigit cell death and why modern birds do not have teeth. Fallon earned his bachelor's in zoology and doctorate in biology from Marquette University in 1961and 1966, respectively. A career in science was not a forgone conclusion as Fallon began college as a philosophy major. Gerard Smith, a Jesuit priest and philosophy professor at Marquette, was a tremendous influence in those early years. Smith encouraged him to do what stimulated him the most intellectually. Fallon had been accepted into the philosophy graduate program when in his senior year he took a course from John Saunders, the renowned developmental biologist (and 1996 SDB Conklin Medal recipient) who worked on limb development. This changed Fallon's career trajectory. “Smith was encouraging me to do things that made me happy and Saunders showed me that science could make me happy,” he said. As a student, Fallon spent two summers at the Marine Biological Laboratory working with C.R. Austin, a Darwin Professor of Animal Embryology from the University of Cambridge in the UK. His first paper was published with Austin on gametes of the marine worm, Nereis limbata. After graduating from Marquette University, Fallon served two years in the U.S. Army before joining the faculty of the University of Wisconsin-Madison in 1969. He has mentored 32 students and postdocs, and published more than 120 peer-reviewed journal articles, reviews, and book chapters. One of Fallon's proudest achievements was that he reinvigorated the MD-PhD program at the University of Wisconsin-Madison which is now funded in part by the National Institutes of Health. He directed the MD-PhD program for seven years and the Developmental Biology Training Program for four years. 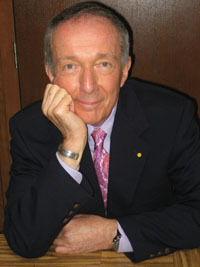 Fallon is an elected fellow of the American Association for the Advancement of Science. He served as president of the American Association of Anatomists, Associate Editor for Anatomical Record and Associate Editor for Developmental Dynamics. His endearing personality (and cool research on dinosaurs) made him a natural for appearances on the Discovery and National Geographic channels. More recent work out of Fallon's lab has concentrated on the autopod or hand/foot portion of the limb. Fallon considers this work the most exciting as it has them rethinking the role that interdigits play in formation of fingers and toes. “Everybody said it was a spacer and you got rid of it so that you wouldn't have webbing and so forth. But, we're thinking of [the interdigit] in terms of it being a signaling center.” Randy Dahn, Fallon's former student, showed that a digit's fate—whether it becomes an index finger or a middle finger—can be changed by manipulating the interdigit region posterior to the digit. They hypothesize that when interdigit signaling is complete, the cells die which coincidentally frees the digits. Fallon expressed much appreciation for all his mentors along the way. “My very first mentor that's really had an effect on me is my Uncle Francis. He was my father's half-brother.” Fallon lost his mother at the age of three and his father at the age of nine. That was when he and his brother went to stay with their uncle. “Francis would sit us down and he would say, ‘You can never let the fact that your father died interfere with what you do. You can't use it as an excuse.’” Despite their young age, Fallon and his brother never forgot that. Fallon met Robert Auerbach at a regional developmental biology meeting as a student. Auerbach invited him to do organ culture work at the University of Wisconsin when he learned no one at Marquette was doing it. Fallon's first experiments for his thesis were done with Auerbach who later mentored him as a young professor. Despite changing graduate programs, Father Smith continued to encourage Fallon. “He said, ‘You're doing the right thing, but I want you to read one serious philosophical book a year.’ And I've done that,” Fallon said. The last person Fallon had to acknowledge was Reed DuFrane, owner of The Tea Shop in Madison, Wisconsin, who taught him everything he knows about tea. “When I came [to Madison] I liked tea. I drank Lipton Tea.” But then he met DuFrane. “After I recovered from the shock of how much it cost per ounce, I engaged him and then we became really, really good friends.” DuFrane has since passed away, but Fallon's passion for tea continues.